Convert Apple Music M4P to FLAC? It's Easy! How to Convert Apple Music M4P to FLAC? Solved! Q: How Can I convert Apple Music to FLAC music tracks? As I know, Apple Music are encoded in M4P audio format and encrypted in FairPlay DRM technology. I have received a portable music device that is compatible well with FLAC but no soup for M4P, not to speak of protected Apple Music DRM M4P tracks. Is there any tool that can make Apple Music to FLAC possible? When talking about extracting FLAC audio files from Apple Music, a common M4P converter can't make it play a role due to DRM protection. on the contrary, you need to equip with a professional Apple Music to FLAC Converter. In this article, we will introduce such an Apple Music tool and show you the detailed tutorial on how to use it to convert Apple Music songs to FLAC format losslessly. There are more and more great DRM M4P to FLAC converting tools in the market. After compared to top five ones according to conversion speed, output audio quality and other performances, AudFree Apple Music to FLAC Converter stands out from them. It's specially designed for Apple Music users to enjoy songs and playlists more convenient. 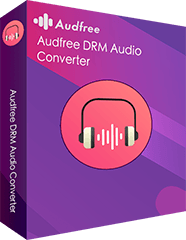 With the assistance of this powerful Apple Music to FLAC Converter, you will be able to not only get rid of DRM protection but also convert downloaded Apple Music tracks to lossless FLAC running 30X faster speed at the same time. Apart from supporting output FLAC files, it also supports for converting Apple Music to MP3, WAV, AAC, M4A and M4B with zero quality loss. Losslessly convert Apple Music DRM M4P to FLAC, WAV, MP3, etc. Please download this all-in-one Apple Music converter on your Mac or Windows computer. And then you can refer to the following tutorial to rip FLAC from Apple Music while removing DRM lock with all ID3 tags and metadata info preserved. Before adding Apple Music files to AudFree software, please make sure you have downloaded Apple Music on your computer firstly. Just click the first 'Add Files' button to load Apple Music tracks to AudFree and then you can select music files that you'd like to convert to FLAC from music library directly. Also, you can drag and drop Apple Music downloads to the main interface for adding. 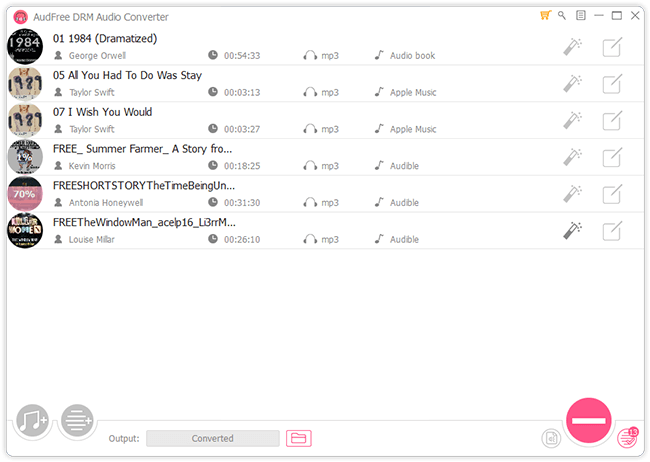 Tips: AudFree Apple Music Converter also supports iTunes M4P music files, M4A/M4B audiobooks as well as Audible audio books, you can use the same way to add them to AudFree program for converting to FLAC for better playback. In general, AudFree Apple Music to FLAC Converter sets MP3 as the output format by default. To define output format as FLAC, you need to click the 'audio' icon to open its setting window. And then you can set to download FLAC music from Apple Music. 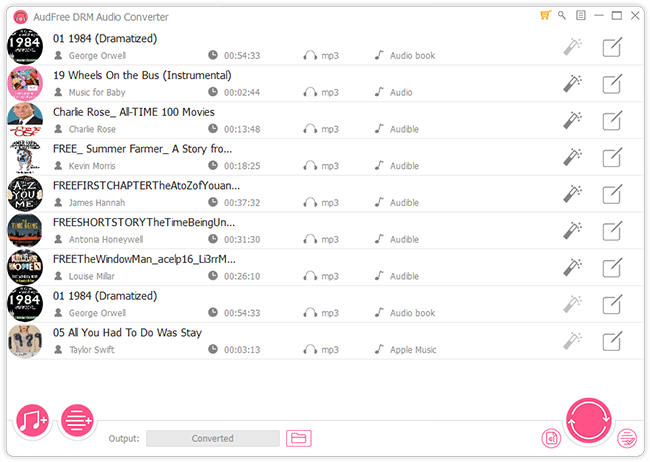 Besides, you can change bit rate, sample rate, audio channel and codec to personalize audio quality in the pop-up window. 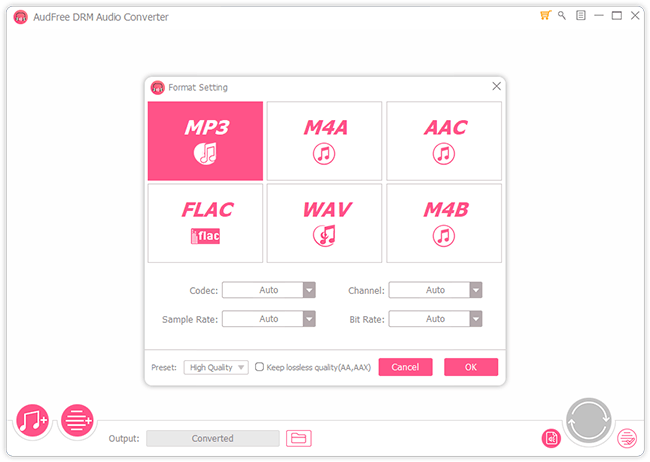 When all settings are ready, you can simply touch the 'Convert' button at the bottom-right corner, AudFree DRM M4P to FLAC converter will start bypassing DRM protection and converting added DRM-ed Apple Music to FLAC audio files. Just wait until that conversion's done. After that, you can locate unprotected Apple Music FLAC music on the destination folder by pressing the 'history' icon. As one of the digital multimedia container formats, M4P is used to store video, audio, subtitles and images. DRM M4P is encoded in advanced audio codec (AAC) with built-in FairPlay technology. This DRM M4P format is used to protect copyrighted works, like iTunes songs and Apple Music tracks. All users can only play DRM M4P audio files on authorized devices and media players only. FLAC (also well-known as Free Lossless Audio Codec) is a lossless audio format for lossless compression of digital audios. It's similar to MP3 audio format, but lossless and compressed, which means that it not only takes up less space but also keeps audio files as excellent as CD quality. Better than DRM M4P audios is that FLAC files are not encrypted, you can play FLAC files in your favorite players without problem. Remove DRM from Apple Music? Solved! Top 5 Best Apple Music Converter Review How to Convert M4P to WAV? Solved!